User-friendly and fully secured remote access to all connected devices. The access can configured in a very granular way, with the possibility to select which devices can by accessed by whom with what rights. The service can also be used to share selected data with third parties, including Open data platforms. Remote monitoring, including tracking of mobile devices, with the possibility to store in the cloud the collected data. The service is able to detect and handle all sorts of events, including abnormal device data and behaviour, and to send alerts and alarms through all sorts of channels, including to smart phones, mails, generated voice, TV screens, etc. Remote maintenance of IoT and M2M deployment, including firmware and software upgrades. 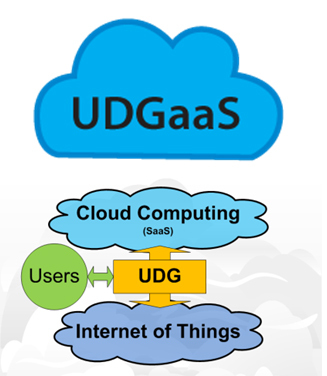 IoT and devices integration with cloud-based applications (Software as a Service) and web services, including EPC Information System (EPCIS), Google’s applications, social networks (Facebook, etc. ), Paypal, etc. It also enables a flexible and modular integration with all sorts of web services, as long as a clear API is provided. Its IPv6 based architecture enables end-to-end secured and encrypted connexions between the cloud and the locally deployed systems.